1 x 25ml Orchid - Seductive - A sweetly seductive fragrance that is a delight to the senses and a lovely skin refresher. 1 x 25ml Lavender - Calming - A soft, cool herbal fragrance that is reknowned for its calming properties, relieving the tensions and stresses of modern life. 1 x 25ml Rosemary - Cleansing - An intense herbal fragrance which acts like a tonic, cleansing the skin and stimulating the body. 1 x 25ml Eucalyptus - Motivating - An invigorating, refreshing fragrance that clears the mind & senses, aiding concentration and helping to make breathing easier. 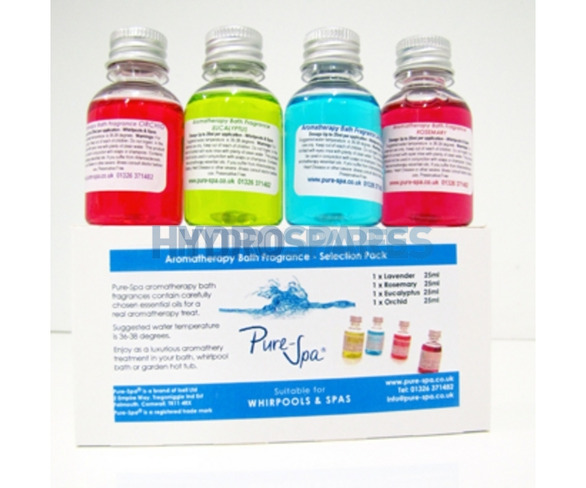 This wonderful selection of fine bath fragrances are a treat for body and soul. These fragrances consist of carefully chosen essential oils and are suitable for aromatherapy treatment, For external use only. Dermatologically tested. Suggested water temperature for the use of this perfume is 36 - 38 degrees centigrade. They should not be used in connection with other soaps or shampoos. If you suffer from arteriosclerosis, epilepsy, heart diseases high blood pressure, cancer or other severe diseases, you should not use this Bath Perfume without consulting your physician. has a calming effect relieving stress and tension. Supports and activates respiration, motivates and stimulates concentration. orchids are well known for their temptation: the orchid perfume delights the senses and refreshes the skin. Selection pack excellent,gives you the chance to choice your favourite fragrances before buying the bigger versions. Very fast efficient service as always!